i still have standards y’all. a book i vaguely remember. though there were plenty of pictures that captured it. by the reactions of everyone in attendance of the party. if there were such a thing. bake the cake as per box instructions. for 6″ i baked for 35 minutes. it did dome a smidge, so it had to be leveled. for the crown: on a lightly floured counter top, lay out the crust layer. with the mind set of an heir and a spare, i made 2 crowns. i measured out 2 10″ wide rectangles. i’m bad at math and space, so one of the crowns was taller, while the other was stubby. just make a chevron/jagged crown. 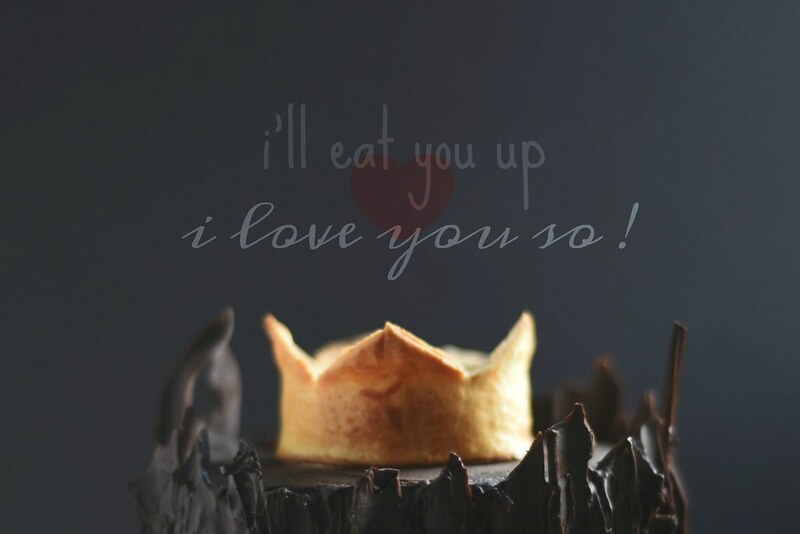 using either the upside of a muffin or popover tin, wrap the crown around the base. for shininess and some color, do an egg wash. bake for 12 minutes, until gold brown. hopefully 1 of the 2 will come out. in my case, the heir died and i had to use the stubby spare. set aside, be careful, try not to break it. for the textured bark: you can either melt the chocolate in the microwave or double boiler style. when the chocolate is fully melted, spread it into a rectangle on parchment paper, you want it as thin as possible, so use an off-set spatula. carefully fold the parchment paper into a roll and fridge it until set. to assemble: lay the first cake layer on a plate or whatever you’re gonna serve the cake on. pipe in a layer of frosting, spread and then top with 2nd layer of cake. crumb coat it. it does not need to be perfect. you do want to make the top be as smooth as possible though, the sides can be bare minimum though. when ready, take the role of schmeared chocolate out and crack it. unroll the paper, you should have varied sized shards of chocolate. adhere them to the sides of the cake, you may need to dab on some frosting to get it to stick. again, it does not need to be perfect, just think of what a tree stump looks like. 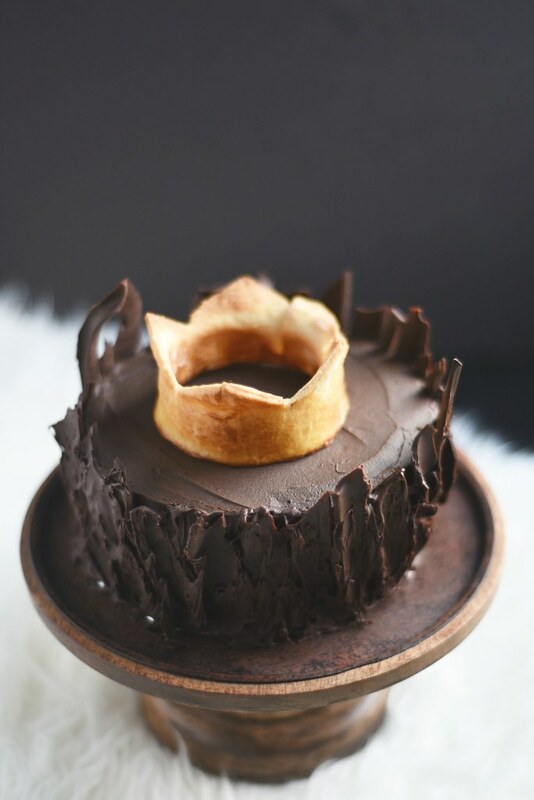 when the sides are sufficiently covered, re-melt the remaining chocolate shards and with a pastry brush, dab on the chocolate to the the cracks and fill in blank spots. you’re aiming for something rustic. fridge it. take out about 30 minutes prior to smashing. top with the crown. thanks so much amanda, i had such a great time putting this together! look at the styling – just amazing. Love this book. thanks hungry mum! i didn’t fully remember the book, i had to skim it all over again, but it was worth it. 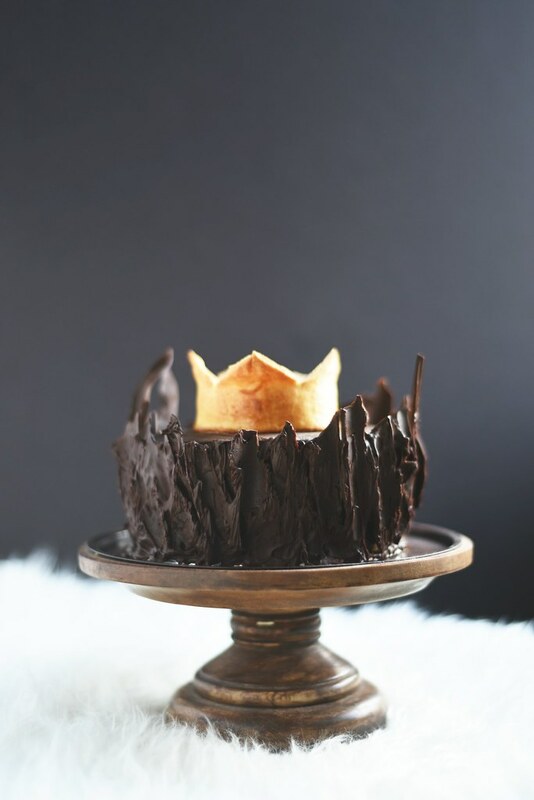 I’m putting in my request now for a crown cake on my next birthday. Love this to death. WENDI! i’m all for it. and we made a teepee for the bday boy and i was like, WE NEED TO MAKE SOMETHING SIMILAR FOR MISS LIBBY! Such a fun cake!! Love the idea. thank you so much Jasmine. The cake, the photography…it all just looks fantastic! This. Cake. This cake should be shown at culinary schools to demonstrate the perfect pairing of style and whimsy. oh movita, you are too kind, thank you.